The Andalusian wall, built of bricks of mud in the 17th century and the Medina reflects the soul of the old town .The squares of ryad courts situated at within the Medina make it possible to read the dotted roofs of the city. This ordered randomness is reflected in the shape of the pattern that makes up the corniche. We mimic the beauty of it by Creating three perforated squares of different sizes that configure the whole promenade. The ad-hoc urban confurations allow for seating areas while integrating plant types and native trees. 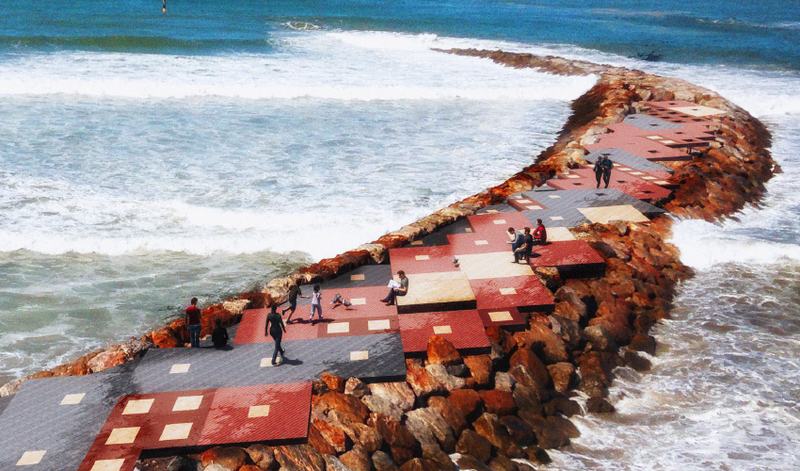 These have varying levels allowing pedestrians to use space and shade to distract and observe the ocean. A true symbiosis of buildings and landscape using interlacing gardens and city mirroring history, Architecture and natural beauty.